The Össur Formfit® Pro range is the ultimate in breathable support technology for people who are passionate about their activities. Össur's Formfit® is a comprehensive collection of quality support solutions. The Formfit® products are designed to support the treatment of various conditions and indications, while offering first-rate comfort and ease of use. The precision-engineered 3D knit delivers professional-grade compression, with added support where needed. Proven superior to leading brands for moisture wicking and breathability, Össur Formfit® Pro technology helps skin stay cool and comfortable. The Össur Formfit® Pro range has unique features that deliver optimum performance and a great user experience. Please check out our dedicated webpage for a closer look at the Formfit® product line. Sometimes, our bodies need assistance. For decades, specialists have trusted Formfit® braces and supports, a complete range of quality products by Össur. A global leader in innovative orthopaedic products, Össur’s biomechanical expertise has helped millions live Life Without Limitations. That’s why Formfit® is The Choice of Experts. 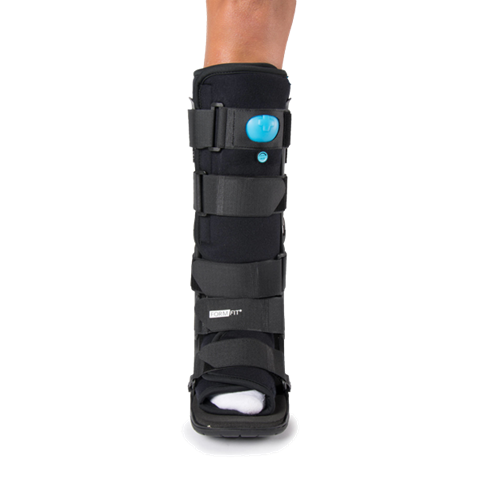 Formfit® offers a robust line of knee products, whether pre-op, acute trauma immobilization, ligament injuries/instabilities or OA. Made from quality materials, our braces are designed to keep patients cool and comfortable while providing support during the healing process. Formfit® ankle supports, walkers and night splints are made from durable materials and have been staples in medical practices for decades. Whether worn prophylactically or for injury recovery, our products will fit your needs. Formfit® wrist and thumb braces conform to the patient’s anatomy. Malleable palmar and thumb stays allow for additional customization. Our universal sizing options reduce inventory needs and are available in pediatric sizes. Our back supports utilize a double pull wrap system for maximized compression. Made from breathable materials, our back supports also feature thumb loops for easy donning. Hot/cold gel pads are available separately. The unique Formfit® Back Support, Air features a pneumatic pump that allows patients to control compression as needed. Formfit® Shoulder brace is available in three configurations: sling only, sling with abduction and sling with external rotation. These options allow you to choose the level of immobilization best suited for your patient.